(Nanowerk News) Today the National Science Foundation (NSF) announced two, five-year, center-scale awards totaling $8.75 million to advance the state-of-the-art in medical and cyber-physical systems (CPS). One project will develop "Cyberheart"--a platform for virtual, patient-specific human heart models and associated device therapies that can be used to improve and accelerate medical-device development and testing. The other project will combine teams of microrobots with synthetic cells to perform functions that may one day lead to tissue and organ re-generation. CPS are engineered systems that are built from, and depend upon, the seamless integration of computation and physical components. Often called the "Internet of Things," CPS enable capabilities that go beyond the embedded systems of today. "NSF has been a leader in supporting research in cyber-physical systems, which has provided a foundation for putting the 'smart' in health, transportation, energy and infrastructure systems," said Jim Kurose, head of Computer & Information Science & Engineering at NSF. "We look forward to the results of these two new awards, which paint a new and compelling vision for what's possible for smart health." Cyber-physical systems have the potential to benefit many sectors of our society, including healthcare. While advances in sensors and wearable devices have the capacity to improve aspects of medical care, from disease prevention to emergency response, and synthetic biology and robotics hold the promise of regenerating and maintaining the body in radical new ways, little is known about how advances in CPS can integrate these technologies to improve health outcomes. These new NSF-funded projects will investigate two very different ways that CPS can be used in the biological and medical realms. A team of leading computer scientists, roboticists and biologists from Boston University, the University of Pennsylvania and MIT have come together to develop a system that combines the capabilities of nano-scale robots with specially designed synthetic organisms. Together, they believe this hybrid "bio-CPS" will be capable of performing heretofore impossible functions, from microscopic assembly to cell sensing within the body. "We bring together synthetic biology and micron-scale robotics to engineer the emergence of desired behaviors in populations of bacterial and mammalian cells," said Calin Belta, a professor of mechanical engineering, systems engineering and bioinformatics at Boston University and principal investigator on the project. "This project will impact several application areas ranging from tissue engineering to drug development." The project builds on previous research by each team member in diverse disciplines and early proof-of-concept designs of bio-CPS. According to the team, the research is also driven by recent advances in the emerging field of synthetic biology, in particular the ability to rapidly incorporate new capabilities into simple cells. Researchers so far have not been able to control and coordinate the behavior of synthetic cells in isolation, but the introduction of microrobots that can be externally controlled may be transformative. In this new project, the team will focus on bio-CPS with the ability to sense, transport and work together. As a demonstration of their idea, they will develop teams of synthetic cell/microrobot hybrids capable of constructing a complex, fabric-like surface. Vijay Kumar (University of Pennsylvania), Ron Weiss (MIT), and Douglas Densmore (BU) are co-investigators of the project. CPS such as wearable sensors and implantable devices are already being used to assess health, improve quality of life, provide cost-effective care and potentially speed up disease diagnosis and prevention. Extending these efforts, researchers from seven leading universities and centers are working together to develop far more realistic cardiac and device models than currently exist. This so-called "Cyberheart" platform can be used to test and validate medical devices faster and at a far lower cost than existing methods. CyberHeart also can be used to design safe, patient-specific device therapies, thereby lowering the risk to the patient. "Innovative 'virtual' design methodologies for implantable cardiac medical devices will speed device development and yield safer, more effective devices and device-based therapies, than is currently possible," said Scott Smolka, a professor of computer science at Stony Brook University and one of the principal investigators on the award. 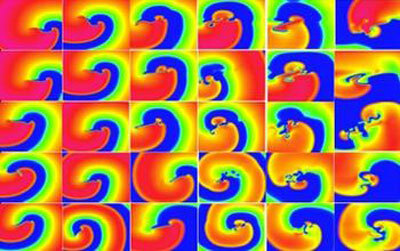 The group's approach combines patient-specific computational models of heart dynamics with advanced mathematical techniques for analyzing how these models interact with medical devices. The analytical techniques can be used to detect potential flaws in device behavior early on during the device-design phase, before animal and human trials begin. They also can be used in a clinical setting to optimize device settings on a patient-by-patient basis before devices are implanted. "We believe that our coordinated, multi-disciplinary approach, which balances theoretical, experimental and practical concerns, will yield transformational results in medical-device design and foundations of cyber-physical system verification," Smolka said. The team will develop virtual device models which can be coupled together with virtual heart models to realize a full virtual development platform that can be subjected to computational analysis and simulation techniques. Moreover, they are working with experimentalists who will study the behavior of virtual and actual devices on animals' hearts. Co-investigators on the project include Edmund Clarke (Carnegie Mellon University), Elizabeth Cherry (Rochester Institute of Technology), W. Rance Cleaveland (University of Maryland), Flavio Fenton (Georgia Tech), Rahul Mangharam (University of Pennsylvania), Arnab Ray (Fraunhofer Center for Experimental Software Engineering) and James Glimm and Radu Grosu (Stony Brook University). Richard A. Gray of the U.S. Food and Drug Administration is another key contributor. CPS research supported by NSF, such as these two new projects, helps to ensure these systems are reliable, predictable, safe and secure. Working closely with multiple federal agencies, including the Department of Homeland Security, Department of Transportation, NASA, the Food and Drug Administration and National Institutes of Health, NSF helps to advance CPS research across multiple application domains and accelerate transition to practice. Including these two new projects, NSF invested roughly $40 million in support of 37 CPS projects in 2015. Since 2008, NSF has invested more than $250 million to build the foundational knowledge underlying all cyber-physical systems.